I hope you all are enjoying this Spring-ish weather. We wanted to provide you with some planned parking lot updates for the community. This work is currently scheduled for the late spring and early summer time frame. We sincerely appreciate your residency, and we hope these projects improve your experience at Traver Ridge. Traver Heights- Areas near building 7 will see new asphalt and pothole repair. The whole community will be crack sealed. Select areas will see parking lot striping. Thank you for your feedback - we 100% agree with you! Unfortunately, this falls under the city of Ann Arbor and we cannot fix it ourselves. What we have done, is reported this issue to the city. You can too! Follow this link and report the problem. The more people that report this, the more likely they are to repair it! Please let us know if you have any further questions or concerns! Thanks for sharing! I have contacted them, and I'm hoping others can do the same. Who do we contact *at the time of* noise violations that are before 10pm, and thus outside the jurisdiction of the Ann Arbor police? When I called the emergency maintenance line, as I thought was appropriate, they told me they only change light bulbs. Confronting the neighbors myself is not an option, as that would be a threat to my personal safety. I hope this message finds you well. I know we were able to speak to you in person yesterday about this but please feel free to email us with any questions. Bill will contact you this weekend to further assist you with this issue. I hope that you are able to enjoy the remainder of your weekend! I did e-mail Bill as well in follow-up. This particular incident occurred in the late evening, after Bill and I had spoken, and was an escalation of the limited issues I have had up to this point. Was there recently fertilizer applied to the grounds? Read more about Fertilzer application? I hope the week is going well. We've recently been doing some reseeding and restoration work behind the buildings at Traver Ridge. These are repairs from the AT&T Fiber installation last fall and winter. They've laid down grass seed and straw mat, but I don't believe any fertilizer. From Yiqun again: I thought this system is to contact via Emails. If you post any answer here, could you please also forward it to my Email, many thanks! I am sorry to hear you are experiencing these issues. I have entered a work order to our maintenance team for you and I have also sent you an email. I look forward to speaking with you soon. Good Morning Traver Ridge and Happy April Fools Day! Just a friendly reminder that your monthly installment is always due on the first of each month. You can make payment online through my.mckinley or make payment to the office during regular business hours. Please remember, that payments become late the morning of the 3rd. We appreciate you all! Enjoy your week!! Read more about April Payment Reminder! why i can not make a payment? I have sent you an email to help further assist with this issue. Have a great day!! Reminder: Rent is Due on the First! This is just a friendly reminder that rent is due on April 1st and will be considered late on the morning of April 3rd. We appreciate you all and thank you for being GREAT residents! Read more about Reminder: Rent is Due on the First! 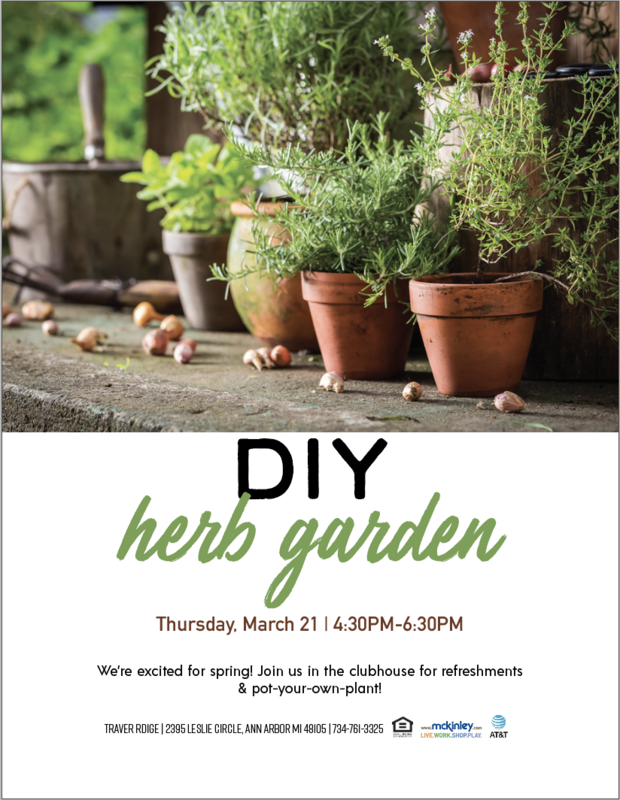 Don't forgot we have refreshments and everything you need to get your herb garden started. We hope to see you at the office this afternoon! Read more about Hope to see you soon!